The Stardust sign at the Neon Museum was once the largest sign on the Vegas Strip, measuring 216 feet long. Thanks to its 11,000 bulbs and 7,000 feet of neon tubing, the Stardust sign could be seen from up to three miles across the Nevada desert. The Neon Museum has more than 150 signs on display in its "Boneyard" area. Weddings and other private parties and events can be held at the Neon Museum. Both indoor and outdoor event venues are available and can accommodate a range of party sizes. The visitors' center at the Neon Museum was formerly the La Concha Motel lobby. A fine representation of mid-century modern architecture, it serves as an ideal welcoming center for museum guests. 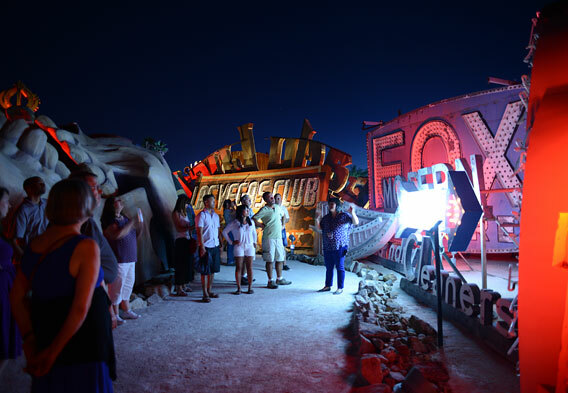 The Young Electric Sign Company (based in Salt Lake City) donated a number of signs to the Neon Museum and, among other things, it is credited with creating the Viva Vision canopy at the Fremont Street Experience in downtown Las Vegas. The Neon Museum officially opened in 1996 with the installment of its first restored sign in downtown Las Vegas. This sign, known as the Hacienda Horse and Rider, resides at the intersection of Las Vegas Boulevard and Fremont Street. It is one of a number of signs affiliated with the Neon Museum that are displayed publicly in the downtown district. From the start, the main purpose of the Neon Museum has been to preserve old signs like this one that speak to the history of Las Vegas. The goal is to provide not only historic enrichment to museum visitors, but educational and cultural enrichment as well. The historic signs are nothing less than iconic images that once dominated the Las Vegas skyline, and it's wonderful to know that there are people who are dedicated to keeping them around. Following along on its mission, the Neon Museum restored the La Concha Motel lobby and converted it into their visitor center in 2012. Also opened in 2012 was the Neon Boneyard, which is where you will find the majority of the Neon Museum collection. 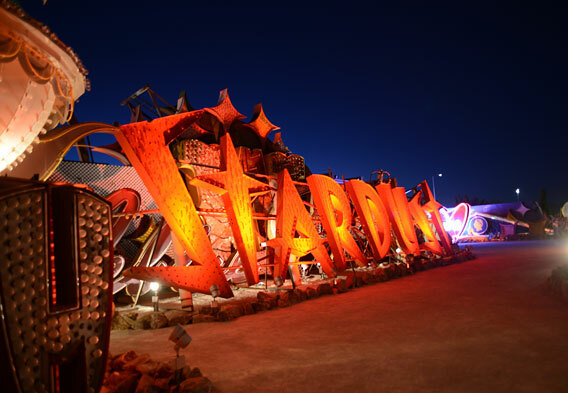 The Stardust sign that is on display at the Neon Boneyard is one of the Neon Museum's most prized possessions. This has a lot to do with the historic significance of the Stardust Resort & Casino. This iconic casino hotel opened way back in 1958 and operated for 46 years. Those years coincided with the development of Las Vegas from a relatively small outpost in the Nevada desert to the booming entertainment mecca that it is today. For decades, the Stardust was one of the main places to play and stay in Vegas, epitomizing what the Entertainment Capital of the World was all about. Much like the Stardust Resort and Casino itself, the Stardust sign was a famous symbol of Las Vegas and will forever hold a place on the city's historical landscape. Adding to the sign's legacy are appearances in several movies, including Casino and Fear and Loathing in Las Vegas. Interesting to note is the size of the Stardust sign. Once the Strip's largest, it is 216 feet long and could be seen from up to three miles across the desert! The address for the Neon Museum is 770 Las Vegas Boulevard North. As far as admission and the hours of operation go, you must purchase tickets while also booking a tour, as a tour is the only way to see the collection. Both day and night tours can be arranged, with the night tours affording the opportunity to see some of the lights illuminated in full splendor. Neon Museum tours are available seven days a week. Tour times vary based on the season. Parking is free for Neon Museum guests and can be found adjacent to the museum off McWilliams Avenue. Since tours often sell out, it is recommended to book them in advance. Discounts are available for seniors, students, active military, veterans, and Nevada residents with proper identification. If you don't fall into one of these categories, you can try to get a Neon Museum discount code. These codes are often made available on the museum's website and can be redeemed for savings on ticket prices. 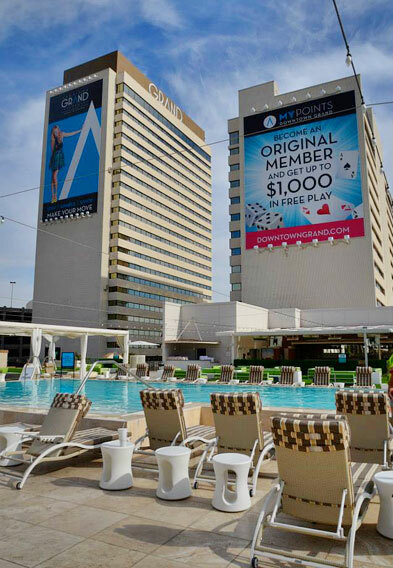 The hotels in downtown Las Vegas have become pretty popular in recent years and give the hotels on the Strip a real run for their money these days. Among the main standouts among the downtown hotels is the Golden Nugget. This landmark hotel opened in 1946 and was the first structure in Vegas that was built specifically for casino gambling. It has been transformed and updated over time and offers an excellent blend of old and new. Another good bet for where to stay in downtown Las Vegas is the Downtown Grand Casino and Hotel (pictured). On the whole, the downtown Las Vegas hotels are well priced, which can help you free up funds for other things, like Neon Museum tours!